Busy place with a big emphasis for food. Expensive but then what do you expect for a Fullers pub. My pint of ale was fantastic though and it is good watching the world go by out onto the market square. Pub can't lose because of its location and always has a buzz but drinks are seriously overpriced. Ale always in good nick but are just as good next door at the Market Inn which is marginally cheaper. Had tried earlier in the day but service was too slow so we revisited as our last port of call on Saturday night. Chatted to a friendly Scot who was in exactly the same position at the bar as he had been 6 hours earlier. Popular, market square Fullers pub so you know what you are going to get in terms of standards, punters and beers; Stonehenge's Eye-Opener was the guest ale but I went for a Fullers Oliver's Island. I liked this place. Being a Fuller’s pub there is usually an irreducible standard applied in that company’s pubs, and this was a good one. I enjoyed their Oliver’s Island (3.8%), a summer-time pint with a “citrus” flavour as brewers often now boast. This couldn’t overcome our feeling about the very soggy weather outside, though we soon forgot the rain: it can be a session beer. The lady behind the bar was helpful and friendly. Good clean toilets. Within striking distance of the station. no luck as an ale drinker, on both my recent visits there was only 1 ale out of 4 so a bit disappointing. 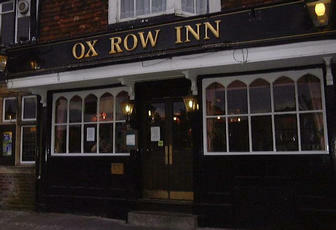 Popular though and good atmosphere (particularly when compared to the market inn next door).